The Yam Improvement for Income and Food Security in West Africa (YIIFSWA) project in collaboration with the National Root Crop Research Institute (NRCRI) trained 18 technicians from 11 commercial seed companies on the operationalization of the Aeroponics system (AS) and Temporary Immersion Bioreactor System (TIBS) for high quality pre-basic and basic seed yam production at NRCRI, Umudike, Abia State. Dr Morufat Balogun addressing participants at the aeroponics facility at NRCRI. 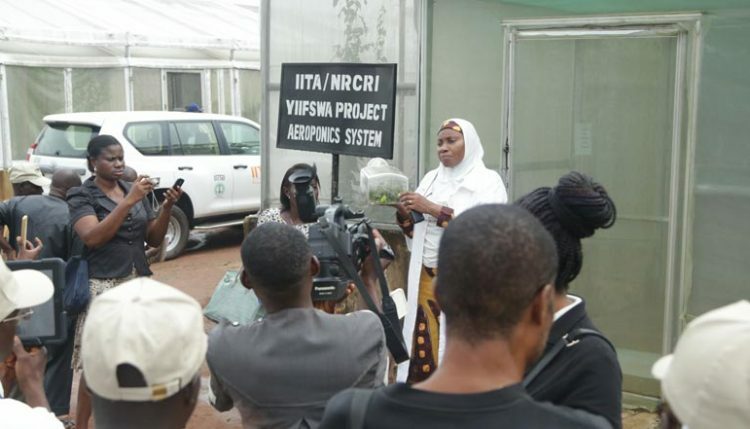 The two-day training which began on 6 October was held at the Institute to promote the operationalization of the High Ratio Propagation Technologies (HRPTs), in particular AS, for high quality basic seed yam production at NRCRI. Participants came from the following seed companies and institutions: Premier Seeds Nigeria Ltd, Da-Allgreen Seeds Ltd, Bumfash Nigeria Ltd, Romarey Ventures Nigeria Limited, Samlak Industries Ltd, Sylva Ejezie Farm Ltd, Mamora Seeds Ltd, Biocrops Biotechnology Nigeria Ltd, Maslaha Seeds Nigeria Zamfara, Nwabudu Agro Seeds, and the National Agricultural Seed Council (NASC). On behalf of the management of NRCRI, Julius Okonkwo welcomed the participants and instructors to the Institute. He said that: “Previously, yam research had a low profile relative to other staple crops like cassava and maize but in recent times, especially with the emergence of the YIIFSWA project, research on yam has come to the fore as evidenced by the quality of technical outputs and capacity building transformations so far recorded under the project.” He implored the participants to engage in the training activities and learn as much as they can for the furtherance of the formal yam seed system. Due to the novelty of the formal seed system and the HRPTs for high quality seed yam production, Beatrice Aighewi, YIIFSWA seed system specialist, gave a presentation on the seed yam systems in Nigeria, John Ikeorgu YIIFSWA’s country manager on important information to consider for seed production and marketing, Morufat Balogun YIIFSWA Tissue Culture specialist on TIBS and Maroya on AS for basic seed yam production. This was followed by a visit to the aeroponics facility at the Institute. On the second day, participants were given practical training on hardening of pre-basic yam plantlets from the TIBS, cutting of vines in AS for transplanting into the system and in nursery bags, and the transplanting of pre-rooted vines in the field for seed yam tuber production. The outscaling of AS in Nigeria and Ghana has boosted YIIFSWA’s efforts towards high quality seed yam production. Launched in September 2015, the AS at NRCRI has generated over 30,000 AS vine cuttings of about nine improved varieties in their multiplication field. This is a success story for YIIFSWA as well as NRCRI, given that it has the national mandate to develop and distribute high quality seed yam of improved varieties through the formal seed system.